With version 9 of Auto Class Composite a new feature is available to create composites in batch mode. With this option we may create the typical school composite having alternatively a student in a larger and main position. The application will crate a different file for each student or person and save it into PSD or JPG format, we recommend to save in PSD to be able to change font and other adjustments. To use this option you have to create a special shape layer (usually a larger one) and place it over the rest of shape layers in the Photoshop layers palette, then select this layer. 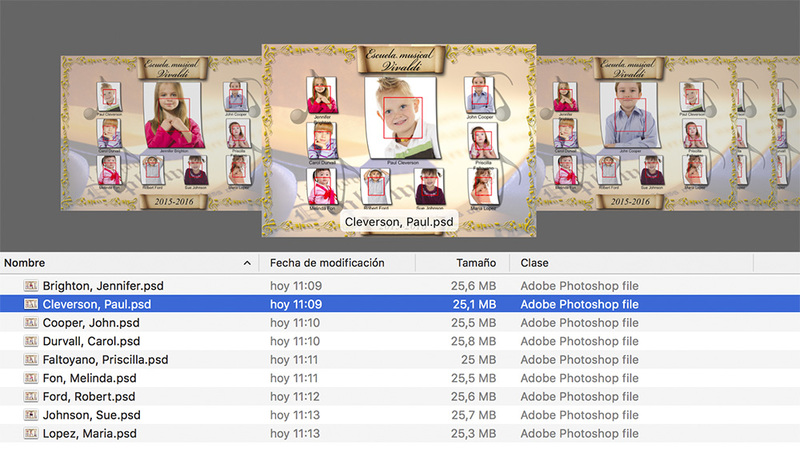 In Auto Class Composite select the Batch composite option and then the folder with your images, at bottom you have to select the target folder for the output files (Do NOT select the images folder as output) and click at Fill composite.